The P.G.I. Tonda Gentile Hazelnut from Piedmont, cultivated in the Langhe, Roero and Monferrato area, is a well-known P.G.I. (Protected Geographical Indications) product of the Italian pastry tradition. The P.G.I. 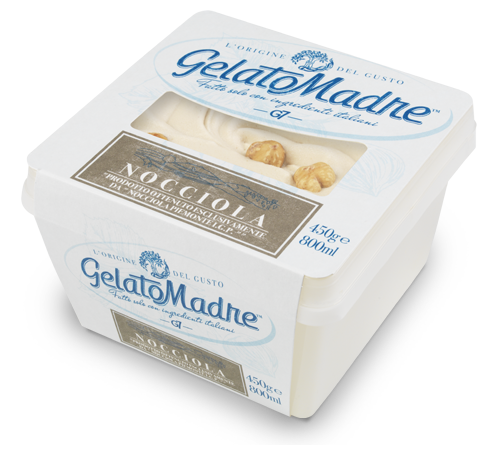 Hazelnut from Piedmont, together with the Italian High Quality fresh whole milk, the fresh cream and the sugar, gives to this Hazelnut Gelato a delicate and unique aroma, enriched by the fragrance of whole toasted hazelnuts on top. GelatoMadre Nocciola with P.G.I. Hazelnut from Piedmont: only 100% Italian natural ingredients, for a unique Gelato going back to the origin of taste. This product obtained from DVN-GL the ISO 22005 certificate which guarantees the origin of the raw materials used.